Orianthi - Orianthi's new album 'Believe' available NOW! If you have never heard Orianthi, I think you are going to be surprised - if you like "rock chicks" who play a MEAN electric guitar, you will simply LOVE Orianthi and her new album, "Believe'. Born in Adelaide, South Australia, Orianthi Panagaris fell in love with music at an early age. Her dad was in a Greek band for years, so she had access to lots of musical instruments which were laying around the house. Her early choice was acoustic guitar until, at the tender age of 11, she convinced her dad to take her to a Carlos Santana concert. Seeing one of her idols live persuaded her to change to electric guitar, and that's when the "magic" started to happen. As we all know, luck and who you know can play an important role in any musician's career. Seven years on, Santana returned to Adelaide, heard Ori at a sound check, after which he invited her on stage to play with him. She ended up playing for 35 minutes, including her very own guitar solo. Skip forward a few years, and Orianthi performed on stage at the 2009 Grammy Awards backing Carrie Underwood. 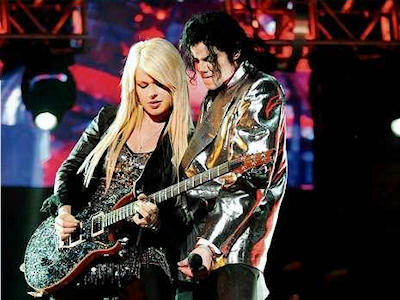 This lead to what could only be called the chance of a lifetime - Michael Jackson called to ask Orianthi to be his guitarist in his highly anticipated tour. Of course, with the untimely death of Michael Jackson, or "MJ" as Orianthi affectionately refers to him, the concert failed to eventuate. However, fortunately for fans of Orianthi she is featured quite a lot in the new movie, "This Is It" - all about the last days of Jackson's life and the preparation and rehearsal for the tour. Back to Orianthi's new album. The first single, "According To You" is a punchy, well written rock song with a great guitar solo (of course). The song is somewhat angst ridden, being about an ungrateful ex-boyfriend, but wow - once you hear it, you'll want to hear it again - and again! From a personal point of view, there is not one song I don't like on this album. My favourites are, even though it is hard to hard to pick only a few as they are ALL fantastic, "According To You", "Bad News", and the title track, "Believe". Even track 10, the appropriately titled instrumental "Highly Strung", is great - even though I'm not a fan of instrumentals. Ori's axe skills are really highlighted here, and whereas each song contains a signature Orianthi-style guitar riff, Highly Strung is pure guitar solo heaven! If I was going to pass the baton to someone, she would be my first choice.